In my last article, I touched on multiday trips. Since then, I received a bunch of requests to write more about this subject. This is easy to fulfil as multiday trips have always been my favourite way to enjoy paddling. Floating down a river or paddling across an open expanse of water is an intimate encounter with Mother Nature. Sleeping next to the water, listening to the beat of waves crashing on a beach or the rumble of water cascading down a rapid is therapy for the soul. Doing it all over again the next day is as good as life gets. To be clear, a multiday trip can mean anything from a two-day-one-night excursion to extended expeditions taking multiple days, weeks or months to complete. Personally, when I do river expeditions, I always find that I only really get into the rhythm of river life after the second night. By the third day, I have completely switched off from modern life with all its distractions and I’m entirely absorbed in the here-and-now. 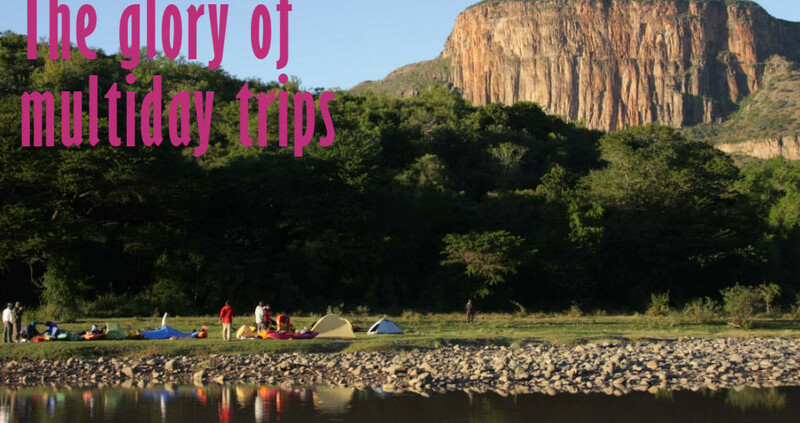 In essence, a multiday trip implies that all the essentials you need for camping are taken along on the trip. The purest way of doing this is by packing all of these items into or onto your own craft. There are other ways to do it too, of course. For instance, I have done a number of raft-supported kayak trips, where most of the gear is packed onto the raft. You could even have the luxury of a backup vehicle that meets you at certain spots along the bank to set up camp, but, in my opinion, this defeats the purpose of going on a multiday trip in the first place. The easiest place to do a multiday trip is on a large dam or lake. Depending on the size of the dam, you can circumnavigate it, embark on a route that takes you to specific spots on the dam like islands and beaches, or just paddle to a destination along the dam’s edge. When you plan a trip on a dam, always make sure to obtain the required permission or permit – if any are applicable. Understand the conditions on the dam. For instance, if there tend to be high winds and big waves, make sure you have the right equipment and skills to deal with this. Also, if there is a possibility of encountering fast motorboats on the dam, attach a flag on a pole to your kayak for visibility. Rivers cater for all kinds of adventures. You can do an easy flatwater trip where the focus is simply on relaxation and experiencing the tranquillity of nature, or you can scare yourself on a Class-5 mission in a deep, isolated gorge; or anything in-between. Whatever you do, make sure that you don’t attempt a section of river that is above your skill level. In fact, don’t attempt a multiday trip on a river that is close to the limit of your skills. A heavy kayak is more difficult to manoeuvre through rapids, and the risk in case of a mishap is increased if you are in an isolated, unreachable section of river. Needless to say, a multiday trip on the ocean along the coastline inevitably involves paddling through the break and back again, dealing with changing weather conditions and the possibility of having to negotiate rocks and shore break if an easy landing spot cannot be found. This is not to be attempted unless you are already a skilled and experience ocean paddler. Needless to say, if you camp wild at a random place next to the water that is not a designated camp site, you have to make sure that there are no access issues. It is common sense not to pitch your tent close to someone’s house, or in any area that the locals may frequent. And the old saying is 100% applicable: ‘Take only pictures, leave only footprints’. Any time is a good time for a multiday trip, provided there is water. The important thing is to dress for the occasion and prepare for changing weather conditions. If you go in the summer, hats and sunscreen are your friends. If you go in winter, drytops and drypants could make the difference between a beautiful experience and hypothermia. If you do a trip in winter, keep in mind that days are shorter, which means less paddling hours. Plan your distances accordingly. Now we get to the nitty gritty of multiday trips. The bottom line is that there is no perfect way to do it. As you gain experience, you will figure out what works best for you. Below are a bunch of points that I consider to be important to keep in mind. This is the most debatable point, but personally I prefer sit-on-top kayaks for most multiday trips in South Africa. The two big advantages of sit-on-tops are safety and versatility. The obvious advantage from a safety point of view is that the boat will float if you capsize, won’t fill with water and you can get straight back onto the boat instead of having to swim to the bank to empty the boat. The other advantage is that sit-on-tops are a lot easier and quicker to get on and off. If you end up in strainers in moving water, being on a sit-on-top is a big advantage for self-rescue. If you get chased by a croc or a hippo or if you just can’t hold your pee any longer, you can very quickly jump off a sit-on-top when you reach the bank instead of having to get out of a closed cockpit. From a versatility point of view, you can sit sideways and hang your feet in the water when you take a break, and you can easily jump into the water for a swim and then climb back on. This may not sound like a big advantage, but on our recent three-day trip on the Orange River, I was very glad to be on my Marimba, for this specific reason. Other types of craft that can be used are sit-in touring kayaks, open canoes, inflatable rafts or, in the case of serious rapids, a whitewater kayak with enough speed and volume for the type of rapids you intend to run. The rule of thumb is to pack as little as possible. Most craft used for multiday trips tend to have more packing space available than a typical backpack for a hiking. It is tempting to use all that space, but keep in mind that the extra weight will have an effect on the handling of the boat, it will be more tiring to paddle over longer distances and there might be a situation where you actually need to carry the boat around an obstacle or pull it up a steep bank. My typical packing checklist includes things like small tent or bivvy bag, self-inflating mattress, sleeping bag, head lamp, medical kit, sunscreen, minimal cool and warm clothing, cooking and eating utensils, food, toiletries, water filter and camera. Each trip is different and will require a slightly different list. If there is a raft on the trip, I pack in a patching kit. I always make sure there is at least one spare paddle in the group. If it is a very leisurely trip, I take a book along. If there are small children on the trip, I add some toys. The most practical way to pack is to have everything in drybags. There are many different styles and sizes of drybags on the market. Make sure you buy good quality drybags; there are few things that can ruin a trip faster than having your food, clothing or sleeping gear soaking wet. If the drybags will be tied on top of a sit-on-top or on a raft, make sure that the dry bag has D-rings or other attachments points on it. I tend to pack all my sleeping things into one big, dry bag and use smaller dry bags to separate the other gear to makes it easier to find what I need. Weight distribution is important too. Pack your heaviest dry bags closest to the middle of the boat. This way the handling of the boat will not be significantly compromised. When I paddle a sit-on-top like my Marimba, I put my stove, gas bottle, food and snacks inside the boat through the hatch right behind the seat. My clothing and other light items go through the hatch on the bow. My large drybag with sleeping stuff is packed into the tankwell in the stern of the boat. Most people don’t want to spent a lot of time on cooking on a trip, so it is best to stick to meals that can be cooked in advance or in one pot. When we do trips with larger groups, we take turns to cook dinner. For instance, if four of us do a five-day-four-night expedition, we take a turn to cook one dinner for the group. On our recent three-day trip on the Orange River, with six families on the trip, three families were responsible for each dinner, with one family doing the main meal, one family doing a salad and the presenting a worthy dessert. When you do a true wilderness trip, on a section of river that is not frequented by many paddlers, you can bargain on using drift wood to make a fire for cooking. If you cook on a fire, always keep safety in mind and make sure to extinguish it properly. The last thing you want to do is to cause a veld fire. For most trips though, it is best to take a small camping stove along for cooking, even if it is just as a backup. On a multiday trip, it is essential to ensure that you have enough drinking water for the group for the whole period. On short trips (two to three days), you can take along fresh water in containers. It does add quite a bit of weight, but if there are no big rapids to portage, it is a viable option. On longer trips, a filter system is definitely recommended. I prefer gravity filters as they are so convenient. Pump filters have stood the test of time, so you can’t go wrong with these either, especially if you do not need to prepare clean water for a big group. It is always wise to pack water purification tablets as a backup. It also doesn’t hurt to put some anti-diarrhoea tablets in your medical kit in case your filtration systems fail. This is a contentious issue, and there is no simple solution that works in all conditions. But, it is an important point to bring up. How you deal with poop can have negative repercussions on the environment, for other paddlers using the same campsite, and also for local people who might use the area where you pitched camp. The first prize is to not leave anything behind. In larger groups, it is always best to take along a simple porta-potty system (a seat, a 25l bucket with a well-sealing lid and chemical additive). Put it at a secluded spot a discreet distance from camp, and use some sort of signal to show when it is in use. For instance, place a paddle across the path before you make yourself comfortable. Small groups can relieve themselves in the bush, especially if the trip is on a section that is not frequented often. Walk a good distance away from the water and from the camp. Then, find a spot that is not directly on a path used by humans or animals. Next, decide whether you should dig a hole or not. While digging a hole is best in most cases, if you are in a very dry and hot environment, and if you are certain that there is no human activity in the area, you could just leave your poop on the surface to dry out like animal dung. Regarding toilet paper – don’t leave it where you use it. Don’t bury it either, because wind or animals could expose it. Burn toilet paper if you are able to safely do so without causing a veld fire. Otherwise, put it in a sealed bag and take it home for disposal. Instead of toilet paper, use leaves and bury them with your poop. Tip of the day: some leaves have an after-burn effect; use leaves with caution. There are many ways to skin this cat. Sometimes it is easiest to take a shuttle driver along, especially if you have a small group with one vehicle. Make sure your shuttle driver will have a good time while you’re escaping from real life on the water (book them in for a spa). I prefer to use local people whenever possible. If the take-out is in a safe and secure area, for instance on a farm or at a commercial campsite, I drive to the put-in and off-load all the boats and gear. A driver from each vehicle then drives their vehicle to the take-out. Beforehand, I arrange a local person to meet us at the takeout and to transport us back to the put-in for the start of the journey. By arranging it this way, I don’t need to coordinate with a shuttle driver to meet us at the end at a specific time or day, as my vehicle is patiently waiting for me there. If you have a group of competent paddlers and shuttle drivers, drop-offs and organising your own trip sounds too intimidating, hire a guide who is familiar with the river. This reduces a lot of pressure and prevents second-guessing when you’re on the water. Alternatively, join a commercial trip! There are a number of experienced commercial operators who offer guided, multiday trips on a number of rivers. 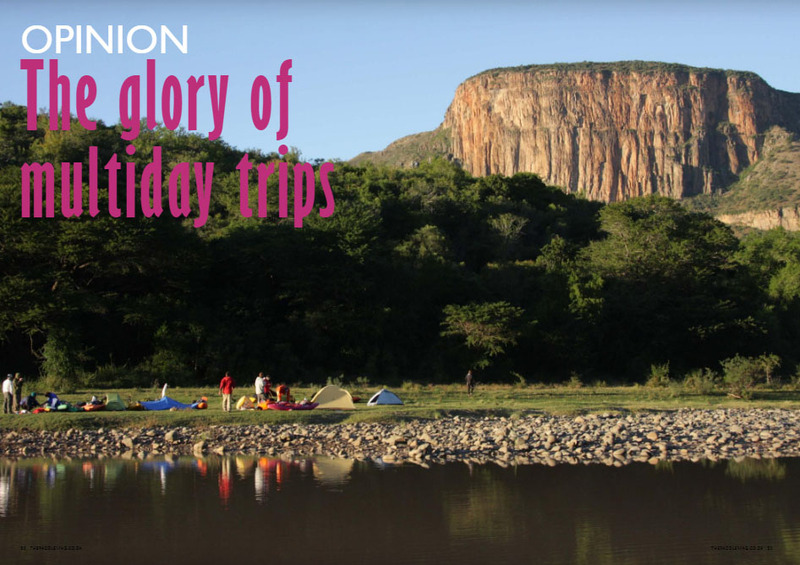 This is a safe and relaxing way to get yourself acquainted with the glory of multiday trips. For their simplicity, multiday trips offer an experience like no other. Spend each day paddling, enjoy the peace of a water-side camp and disconnect from technology to connect with friends and family in your group. Written by Celliers Kruger for the January 2019 issue of The Paddle Mag. This free digital publication can be read online or downloaded to be enjoyed later on your device.